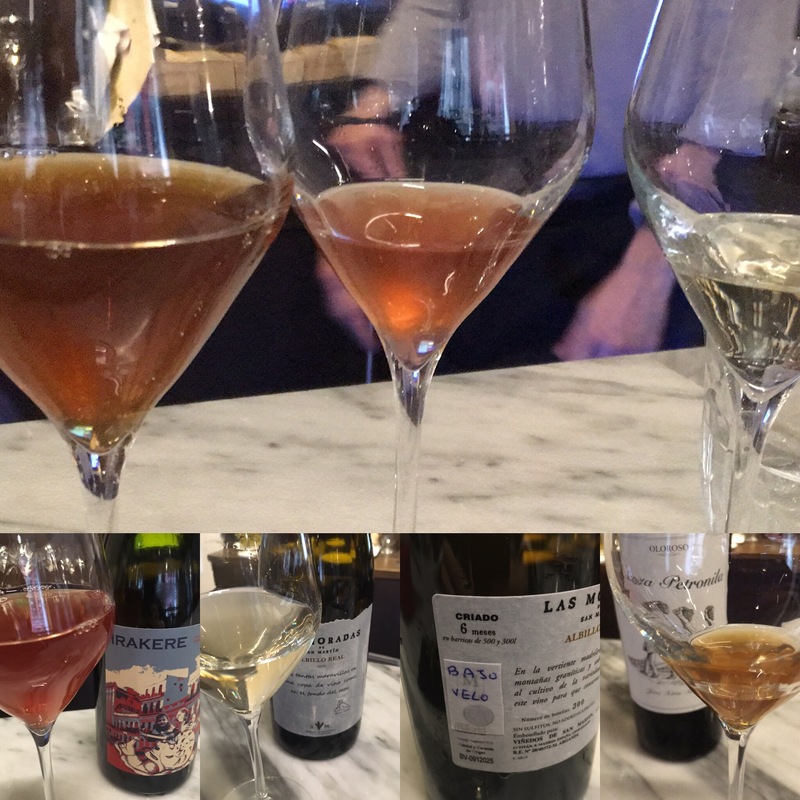 It is funny how the world works – last week there was a tasting at the UEC of natural wines marked by their volatile acid content and for a while all anyone tweeted or wassaped about here in Madrid was volatile – the new cool. Then the next thing I know I am at the bar of Angelita for a light and liquid lunch and by coincidence I hit a rich stream of the new cool. Three extraordinary wines here – Irakere is a macabeo and garnacha wine made in the North by some guys from Valencia and, as you probably gathered from the introduction, the volatile is just extraordinary (makes the wine seem lighter than air, if a bit stingy). Then the Las Moradas Albillo Real “Bajo Velo” (not much velo, it was only six months in the barrel and velo of what, you might ask) and, while not as extreme as the Irakere, that also had a solventish edge to it – slight lift at the edges on the nose and palate. And then finally the Santa Petronila oloroso. Now the first time I tried this back in October I found it lighter and finer than your regular oloroso and to be honest even on that occasion there were mutterings about volatile, but today it really seemed to come across very clearly – even compared to the Irakere. It was also pretty turbid and it was pretty interesting to see if from this natural wine angle. Very interesting indeed. Fortunately the other thing that Angelita does exceptionally well is cheese, which helped take the razor edge off the liquid!